This is a slow cooker meal for those that don't have a slow cooker, like me. This is something I cook when I know making dinner in the evening will be difficult as I have a busy day ahead. So I put it to bake earlier in the day, go about my day, and dinner is ready when I need it with little effort. This is a subtle flavoured curry dish, especially good for new people to curries as you don't get a huge spice hit. The rice that accompanies it is lovely. The yoghurt and sauce that is made after it is baked looks a bit curdled, so what I do is i push it through a sieve to make it look nicer, but if you don't care, you can skip this step. My whole family loves this, it really is a family friendly dish. Using a sharp knife make 10 x 1cm deep cuts all over the lamb. Season the lamb well with salt and pepper. Heat a large non stick frying pan over high heat until it is very hot. Add the oil, then the lamb. Cook for 10 minutes, turning, until browned all over. Remove from the frying pan, allow to cool on a plate for 15 minutes. Preheat your oven to 150C/130C fan forced. In a medium sized mixing bowl, combine the yoghurt and the curry paste, mix well to combine. 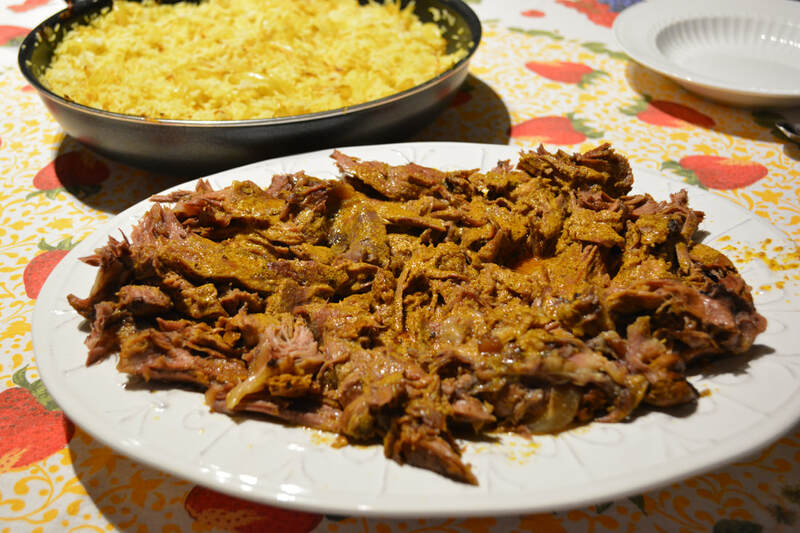 Once the lamb has cooled spread the yoghurt-curry mix thickly all over the lamb, push the mixture into the cuts you made. Place the lamb on a rack in a roasting tin. Pour the stock into the base of the tin, not over the lamb. Place a sheet of baking paper over the lamb then cover the lamb tightly with two layers of aluminium foil and bake for 6-7 hours, until the meat falls off the bone. For the spiced rice: I like to cook my rice in a rice cooker, but you can also do it by the absorption method, follow packet instructions. Heat the oil in a large non stick frying pan over medium heat. Add the onions and sugar, cook, stirring, for 10 minutes, or until golden. Add all the spices, cook for a further 2-3 minutes. Add the warm rice and toss until well combined. Remove the lamb from the oven, rest for 30 minutes (if your pushed for time you don't have to). Use two forks to shred the meat, it will fall apart very easily. Place the meat on a platter. Strain the pan juices through a sieve into a jug, then pour over the juices onto the lamb. ​Sprinkle over some chopped coriander. 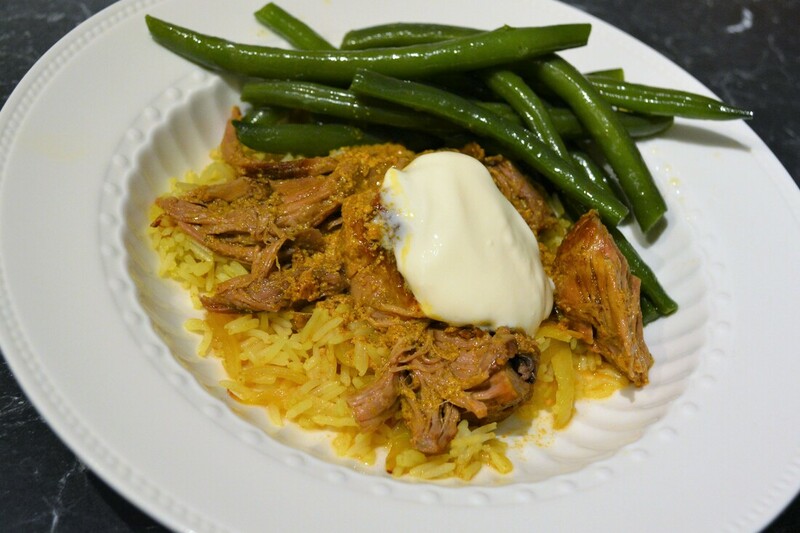 Serve hot with the spiced rice, a dollop of Greek yoghurt and green beans if you like.